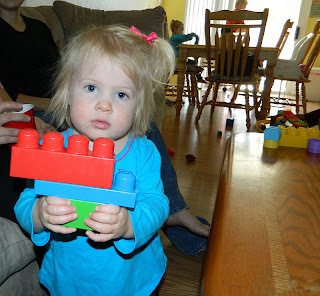 I got to host a Mega Bloks Party for my mommy friends and their kiddos! I couldn't believe how huge my kit was when in came in the mail! They sent me a HUGE tub of Mega Bloks for my kiddos to keep. I thought I had a big bag of bloks before, I got this tub! I was also sent some sets to give to everyone that attended- Jungle Friends and Garden Friends. I think I got a great turn out because everyone found out that they were going to get a gift and not be asked to buy a gift! We had a great party and it was crazy having so many kiddos in my house at once. There were seven moms, one grandma, 13 kids, and three babies growing in their mommies tummies in attendance. As bad luck would have it, my camera wouldn't turn on the day of the party. Something I realized after my first guest arrived. (Note to self, don't let Mark chew on my camera) Thankfully another mom brought her camera to capture the moments for me. The kids were very excited about playing with the blocks and each other. My Mega Blok ride on toy was a huge hit among the boys! Our first game that we played was build a tower. It's a simple game where the kids try to build the largest tower without it falling. This was great fun for the bigger kids (over 2) and even more fun when the game switched to demolition time. All the kids had a great time demolishing the towers!! In fact building something just to tear it down became the best game to play! After we ate some pizza the kids were fired up and ready to go again! It was then that I had everyone fill out their raffle form since things were somewhat calm. My raffle prize winner was very excited to win a set of Mega Bloks since she has a new baby on the way that will get to play with them! The kids favorite "game" was walking through them and making the bloks fly! I'm not sure what she made since she's too little to tell me. Isabella building her first tower. "Look Mommy, it's almost as big as me!" After they knocked it over, the made a "snake" on the floor. My twins working side by side. The party was a huge hit and we had a great time! I would like to thank all my friends for coming and having the biggest play date party with me! 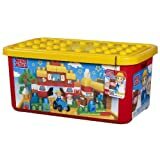 You can find great Christmas presents for the preschooler in your life from Mega Bloks. Disclaimer-I was selected by MomSelect and Mega Bloks to host this party. I received free product to keep and to give to my guests in exchange for my post. I was not compensated in any other way and all opinions are 100% mine. just find your blog. happy to see any other mommys around. i have two girls :) i follow you if have some extra time you can check my blog too. Megabloks are nice toys. i like them and girls have some. Very cute! I always loved mega blocks. Love that the tower is almost as tall as her!